Volunteer patrols are staffed by retired police officers from both the Associazione of Cives Catervae Custodes Martyrs of Nasiriyha and the Associazione Regionale del Lazio Vigili Urbani in Pensione. They are on duty every day from 9 a.m. to midnight. The trial period will end in mid-October, at which point city officials will decide whether or not to make the patrolling permanent. The move is an effort to control the large crowds that surround the fountain, and a further step to eliminate unruly behavior. Earlier this summer, Rome banned people from eating on or around the fountain, getting in them, letting pets drink from them, or throwing things into them (with the exception of coins). The ban on these behaviors also applies to around 40 historically significant fountains in Piazza del Popolo, Piazza di Spagna, Piazza Barberini and Piazza Navona. 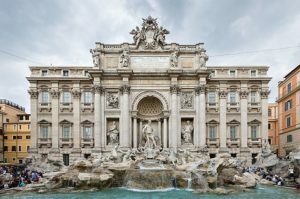 The Trevi Fountain reopened in November 2015 following a 2€ million restoration funded by Fendi, and is one of the most popular and crowded tourist attractions in Rome.